This is a lovely pattern. I would like to know who designed it. Thank you. I didn’t notice the “kr” at the end of the website. This is lovely but not sure what size beads to use, are the pearls 3 or 4mm, also I think there are diamontes (the 4-way bead on the top pic)? I guess it’s a two needle stitch as well? Anyone help? can you be more specefic with the diagram and send step by step help? You can find the bead sizes in the supplies list at the bottom. I hope that was helpful! Hello. 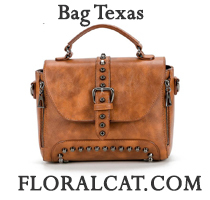 What a lovely item for Valentine’s day! This is done with two needles and in right angle weave; the blue color indicates one needle’s path and the red color the other needle’s path. The seed beads are size 11 and probably galvanized silver. The pearls are 3mm. The Crystalettes or rhinestones (or you could substitute Fire Polished Crystals here I would guess) and they are 4mm. The glass drop is 5.5 mm. First make the little row – very left diagram. Where you see the horizontal lines means that you keep repeating that pattern. When you get to the red dot, the pattern changes and you add two beads instead of one. Every red dot indicates a pattern change. Do this for 37 units. 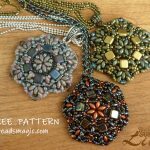 Then you have to take your beading and make a circle by making the ends meet, I think. (I have not made this yet, so I am just telling you what I think I am going to do. Then you come out on top of your right angle weave circle and embellish it by adding 3 mm Burgundy pearls and what looks to be like Crystalettes (or Montes?) in another right angle weave stitch as shown in diagram 2. I am assuming that you start at the seed bead to the right of the dip of the heart where there are two lines coming in. 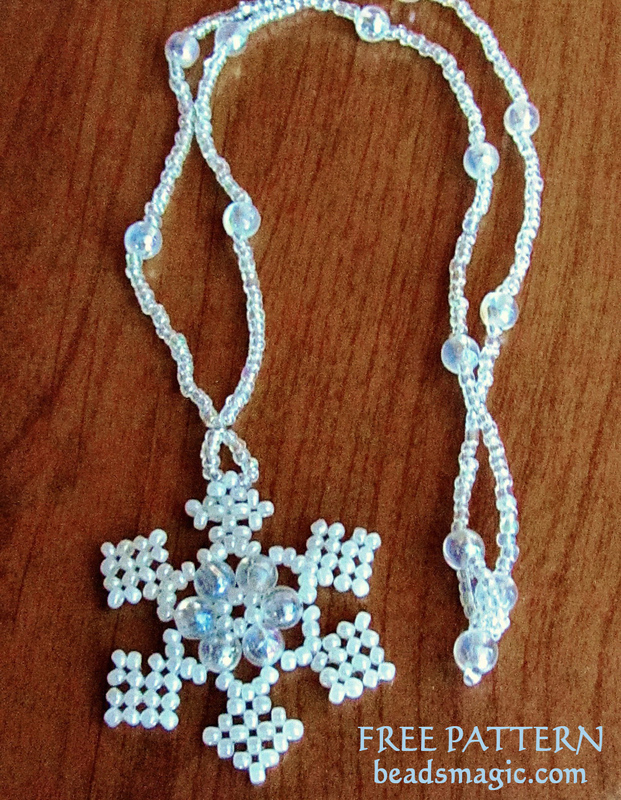 Add the seed bead, pearls, and Crystalettes as shown, weaving on top of the existing bead work. 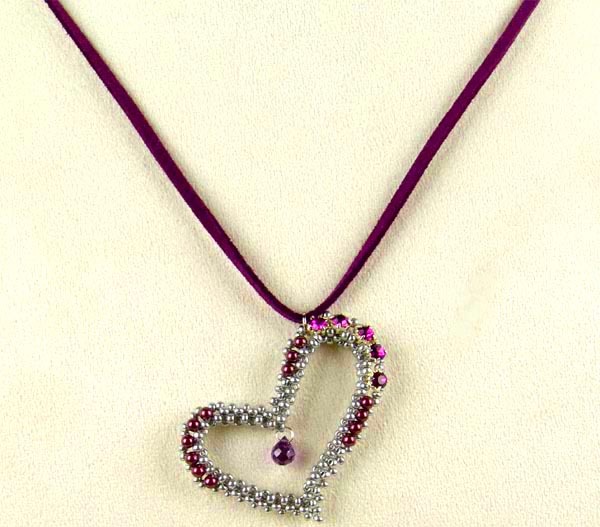 I am not sure how the crimp for the top center of the heart is done. You will be adding a jump ring where the arrow is. Your jump ring should be big enough to hold your chain or ribbon or whatever. There are no start marks or stop marks, so my apologies. I would say to end these threads after you have embellished the second step. Then do the third diagram, making a knot where shown and, still using two needles, add the colored beads and stitch thru the faint grey beads as shown. Add your drop where indicated. She used a jump ring and I would put a size 8 seed bead there to attach a jump ring to. Unless you have a very fine, lightweight jumpring, you won’t get it through an 11/0 hole. I hope this answers questions. Give it a try. I am. This is neat. Hi again. The 4mm rhinestone like beads might be Montees by Swarovski, not Crystalettes. I am going to try to substitute Fire polished crystals there anyway. I might have to use 3mm instead of 4mm. Thank you so much, CBracht, for your detailed explanation! I didn’t understand the 3rd (last) diagram until after studying it for a while. 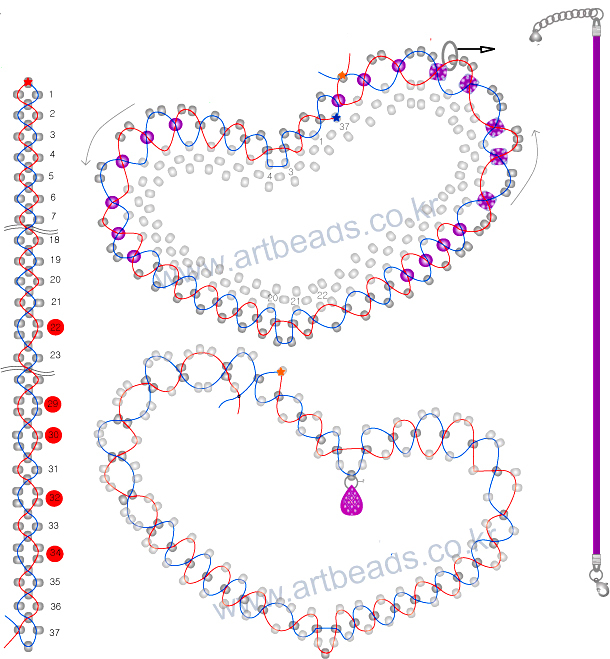 On that diagram, the only “colored” beads appear to be where the threads intersect, except for the dangle and the bottom point of the heart. 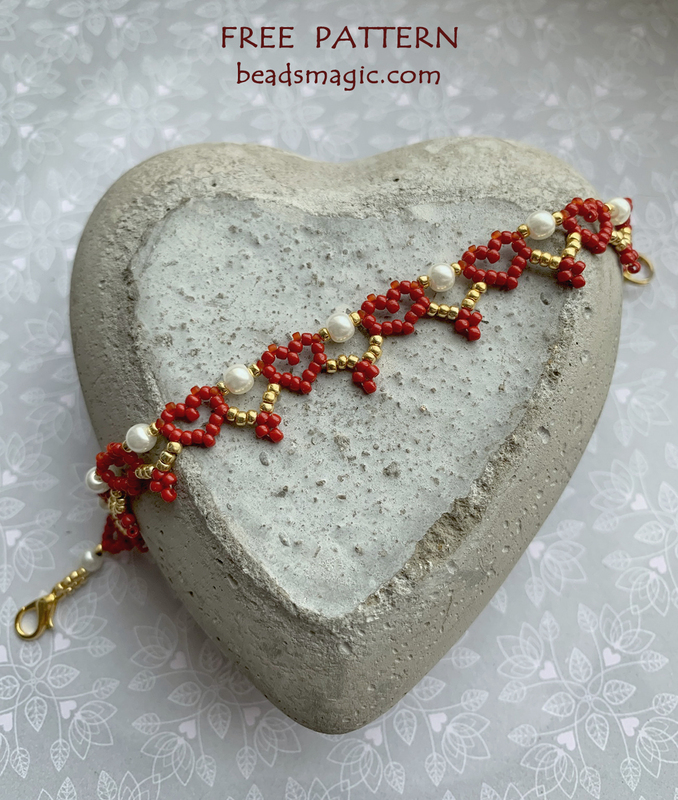 It appears that after you do the beading in the 2nd picture, you flip the heart over and then go through the thread paths as in diagram 3, adding the beads where the threads cross. And since the heart is flipped over, in effect you’re adding those beads to the back of the pendant, giving it a little bit of a 3D effect. At least that’s how it appears to me. I’m going to try making the pendant. I don’t have anything that looks like the little crystals, so I might try to come up with a substitute for in my pendant, unless I can find something like that. 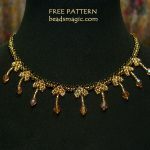 I know they have crystals like that on Artbeads.com, but I don’t know offhand if they have any that small.